Los Angeles metal titans WINDS OF PLAGUE have debuted an all-new music video today for their brand new track “Never Alone”. Directed by Orie McGinness, this is the first bit of music we’re hearing from the band from their upcoming LP, “Blood Of My Enemy”, which will be released on October 27 via Entertainment One Music (eOne) / Good Fight Music. “‘Never Alone’ was actually one of the first songs written for this record and immediately became the balance point for the remaining songs that were to be written,” says vocalist Johnny Plague. “It’s not the heaviest song of the record and it isn’t the most melodic song of the record. He continues: “I have always used WINDS OF PLAGUE music videos as an opportunity to create cinematic shorts. ‘Never Alone’ is no different. “We partnered with Enlighten Creative Studios to tell the story of a misunderstood woman who has harnessed her inner demons to her advantage. 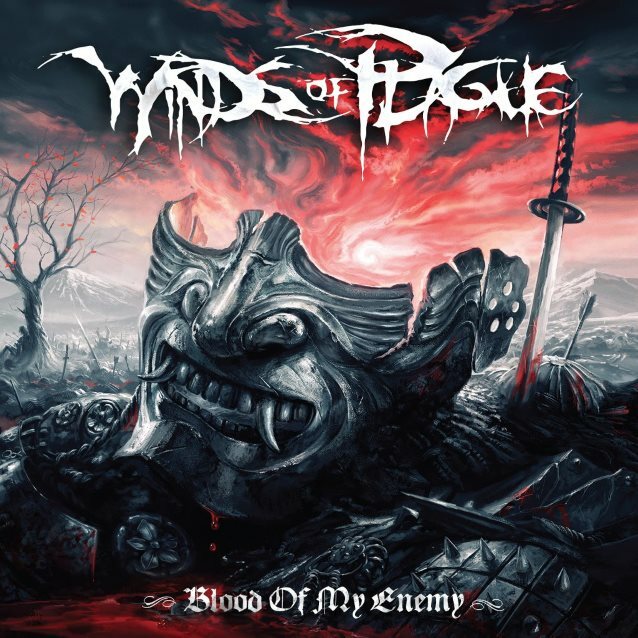 “Blood Of My Enemy” is the follow-up to the “Resistance” LP, which was released in 2013. “Never Alone” is available as an iTunes instant gratification track. Fans who pre-order the LP on iTunes will get the track as an instant download. “Never Alone” is also available on all streaming platforms starting today. He continues: “Although it was different and humbling, it proved to be the unedited creative environment we needed for this record. We had no time limits, no ‘suits’ giving their input. It was just a few friends sitting in a room together, having a good time creating music. Something I haven’t been able to experience in a very long time. “Sometimes to move forward you have to take a few steps back. WINDS OF PLAGUE teamed up with artist Pär Olofsson to create the stunning cover art seen below. WINDS OF PLAGUE will support SUICIDE SILENCE on the “10 Year Anniversary of The Cleansing” tour for a handful of dates in December.